Itty Bitty Totes is a key chain coin purse pattern. Hang from a purse or tote to carry cash, I.D., chapstick or tissue or any other small items you can think of! Great size for carrying a pacifier also. This tote is also perfectly suited to be used as a purse for an 18" doll. 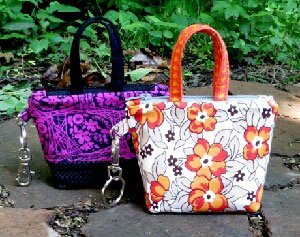 These little totes can be made from 2-3 fat eighths or use scraps from your stash. Finished Measurements: Each Itty Bitty Tote is approximately 4" H x 4-1/2" W x 1-1/2" D.